Every town had its “country doctor,” the kindly, beloved physician who had a gentle voice and would come to your home at any time of the day or night to cool fevers and soothe pain. Born in New Haven in 1897, Francis Bowditch Woodford graduated from Yale College and Medical School, was a lieutenant in the Army Air Corps in World War I, and came to Ridgefield in 1926. His first home-and-office was at New and Gilbert Streets, a rental. He moved in at the same time the state was converting Main Street from a dirt road to a paved road. That turned out to be an unusual benefit for the new doctor, who’d just hung out his first shingle. “People had to detour right past the house and it was so bumpy that they had to travel very slowly,” ‘Fritz’ Woodford said in a 1970 interview with Sally Sanders of The Ridgefield Press. “About the only thing they had to do was read signs.” People did, and soon nearly everyone knew there was a new doctor in town. 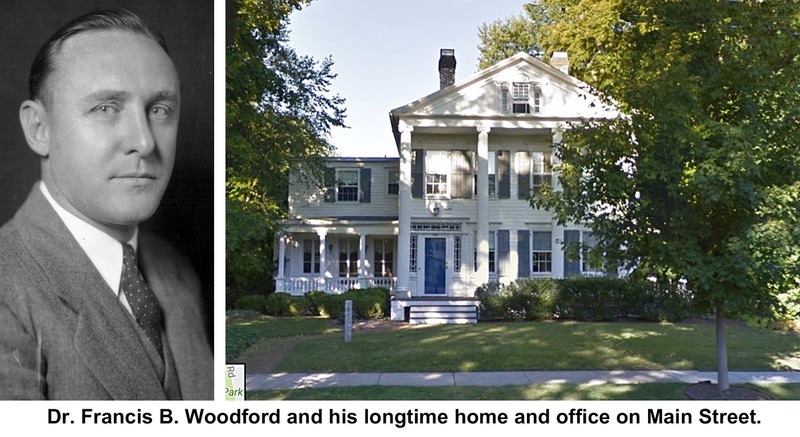 A year later, Woodford and his wife, Julia, moved to a house down Main Street across from the Community Center, where he was to remain for the rest of his career and life. Back in the 1920s, there was no need for appointments. “We’d have office hours beginning at one, and people would walk in and wait their turn,” he said. Office hours ended when the last patient was treated. Obstetrics was a part of a general practitioner’s job then, and Dr. Woodford delivered as many as 35 babies a year – often in homes. During the Blizzard of 1934, he skied to at least one home for a delivery. Another time, during a 36-hour period, he delivered four babies. The deliveries could be hectic. “I was with one mother, who was having her fourth or fifth,” he recalled, “when Irene [Hoyt of the District Nursing Association] called to say that I’d better hurry over to help the mother she was with.” He rushed there, delivered that baby and returned to the first mother who had promised to wait for his return. She did, and Dr. Woodford delivered that child, too. Homes where deliveries took place were sometimes pretty primitive. He recalled one house that had no running water or electricity — just a spring outside and a lantern held by the husband. “Doc, we’re 50 years behind the times,” the husband said. But the baby still got the most modern treatment, among the first to get the new triple vaccine, protecting her against tetanus, diphtheria and whooping cough. From 1940 until 1970, he was the town health officer, but also served many years as the school doctor and as the medical consultant to the Selective Service Board in Danbury. “I read aloud and my wife likes to listen,” he said. Julia, who was his secretary throughout his career, was active in the community, especially conservation. Woodford died in 1977 on the day before his 80th birthday. “He was kind and gentle and good,” said former first selectman Leo F. Carroll, who knew him for 50 years.